Since my mom is retired and I'm now a stay-at-home-mom, my mom and I typically get together at least 1-2 times per week. She loves spending time with her grandson (and her daughter!) and we love it as well. She also gives me some free time to do things around the house or run errands that can be difficult to do with an almost 6-month-old, so her visits are very much appreciated! She usually brings over lunch, which often makes me feel guilty. If she's coming over, I should give her lunch, right? Sometimes we just do something easy like peanut butter and jelly sandwiches. But this past time I decided to make something a little more fun. This lunch was light and healthy, plus easy enough to make with Bradley in the background. It's a perfect girls snack since it's not too heavy, yet still enough to satisfy our appetites. Enjoy! Heat a large saucepan over medium-high heat. Add 1/2 tbsp. olive oil to pan. Add onions and cook for 2 minutes, until tender. Add garlic and cook for 1 minute. Add quinoa and cook for 1-2 minutes to lightly toast. Add warm beef broth stock and salt and bring to a boil. 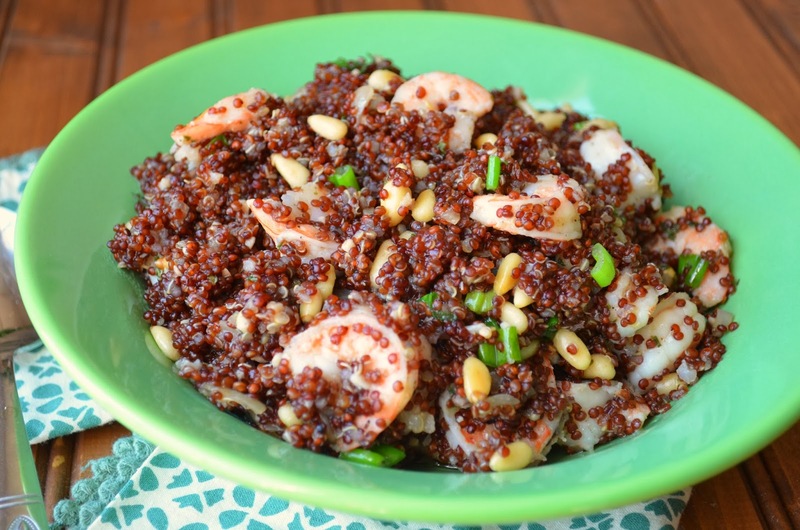 Cover, reduce heat, and simmer for 25 minutes or until liquid is absorbed and quinoa is tender. 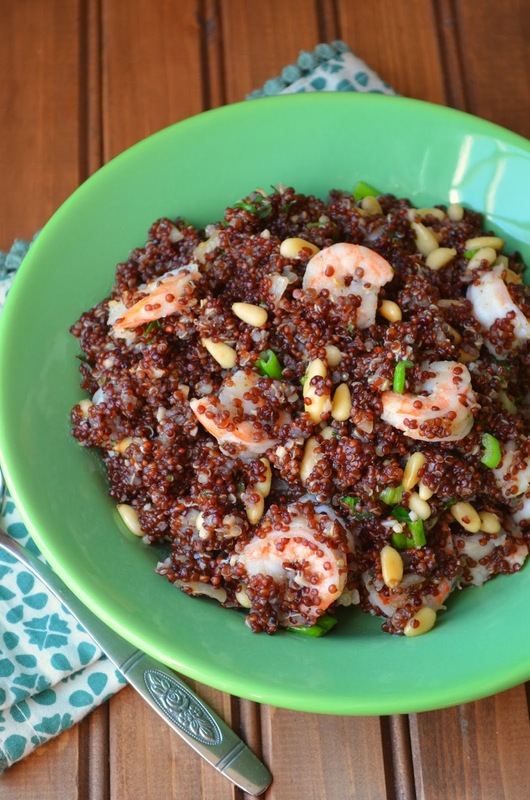 While quinoa cooks, heat a large nonstick skillet over medium heat. Add pine nuts to pan. Cook 4-5 minutes or until lightly browned, stirring frequently. Remove from pan and set aside. After nuts are done, add 1 tsp. olive oil to the same pan. Season shrimp with salt and pepper. Add shrimp and cook for 2 minutes per side, until pink. Remove and set aside. 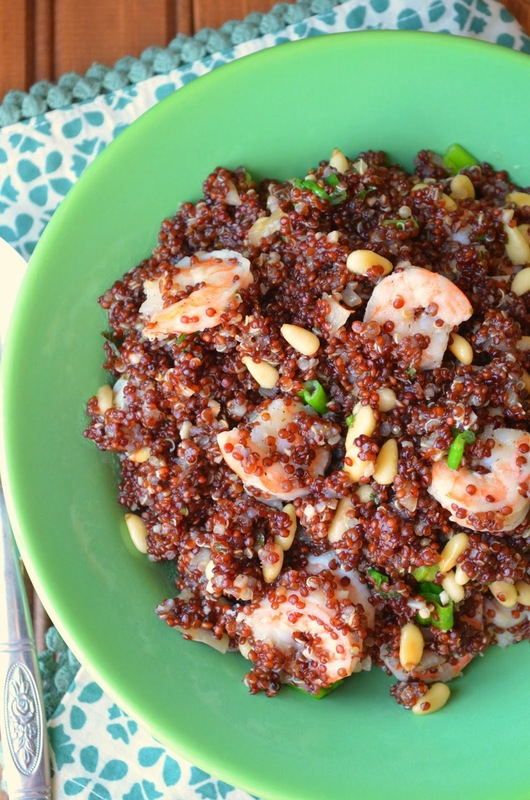 Once quinoa is done, add pine nuts, parsley, scallions, pepper and shrimp. Stir to combine. Drizzle olive oil over the top. Serve warm or at room temperature.